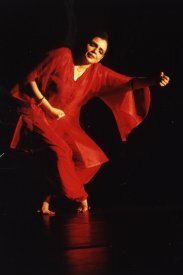 Dancer/choreographer, transcultural collaborator, cultural activist, Anita Ratnam is the Founder-Director of Arangham Trust and Artistic Director of Arangham Dance Theatre. Her foundational training is in Bharatanatyam, supplemented by the Kerala traditions of Kathakali and Mohiniattam. 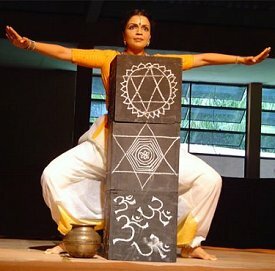 She holds a Post Graduate Diploma in Bharatanatyam and Dance Theory from Kalakshetra (Chennai) and a Master's degree in Theatre and Television from the University of New Orleans (USA). 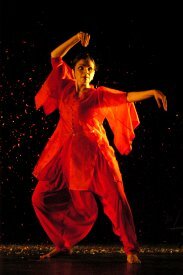 Combining the ancient with the modern, crafting choreography from personal experience and classical vocabularies, Anita has reinvested the canvas of her dance-art with a highly personal style she now calls Neo Bharatam. the international portal dedicated to Indian dance and is the Co-Founder-Artistic Director of India's only annual contemporary performance festival THE OTHER FESTIVAL held every December in Chennai. She is currently pursuing her PhD. in Theatre Studies. Working with several dancers in her many productions since 1993, Anita returns to a solo presentation. Her highly personal movement vocabulary is greatly inspired by theatre and the aesthetics of Butoh and liturgical intensity. 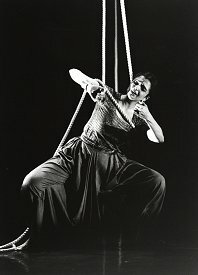 In her 2005 international collaboration with dancer/choreographer Hari Krishnan, Anita continues to perform and create dance-theatre that is intense, intellectual and provocative. SEVEN GRACES is the title of the work. As the name, it is international and open ended in the content as well! Drawing on the universal symbolism of the mystical number 7, 'SEVEN GRACES' embraces the many moods of human experience, seven colours, seven sections, seven charkas. The original springboard for the choreography was the mythology and the many moods of the Buddhist Goddess TARA. With the world premiere this week in Chennai, Anita speaks about her new work and choreographic journey. Your themes are always about Goddesses - 'Andari,' 'Daughters of the Ocean,' the three goddesses including a Chinese goddess in 'Utpala' and now the Tibetan Tara. Any particular significance? Yes. In retrospect it seems almost predictable and trite. However, each work was born from an image or a phrase that I saw or read. With ANDARI, it was the story of American feminist writer/shaman Meinrad Craighead (who lives in Alburquerque, New Mexico) who wrote of a spider woman spinning the world from her web while singing the first song. Later I found the same reference in our scriptures. That is why the web as stage design plays an important part of the choreography. With UTPALA, it was the image of a lotus that kept haunting me for two years until I researched and found the resonance in the cultures of Egypt, India and China. It is hard to convey the depth of information or feeling without some kind of narrative - either historical, mythological or personal. I had explored the personal in DAUGHTERS OF THE OCEAN and was fascinated with the comparative mythologies of the blue, red and white lotus. The Kwan Yin image in UTPALA was perhaps a precursor of the Tibetan Tara in SEVEN GRACES. It seemed to be leading me gently towards this new piece almost organically. Having said that, I feel that SEVEN GRACES is not a linear narrative retelling of the TARA story. You will not get the knowledge or the idea that she was born out of the tears of the Buddha or her many lovely little stories. It is a retelling of the idea that the word GODDESS is a verb and not a noun... it is a very present-tense real world situation in which I believe that each of us women are active principles in everyday life. After your last collaboration with Hari Krishnan on 'Adhirohana' and 'Movements and Monuments,' there has been quite a gap till 'Seven Graces.' Who initiated the first dialogue on this solo production? It was I who suggested the collaboration. Adhirohana has been a favorite piece of mine every since its creation in 1998. In Japan earlier this year, when I traveled to Kyoto to present VAITHARANI, I was invited to Osaka to present something from my repertoire to a general Japanese audience. I chose Adhirohana to showcase Bharatanatyam as well as our mystical yogic traditions of 'nadi' and 'chakras'. It was so well received that soon after, when I was at Wesleyan University in Connecticut where Hari Krishnan teaches, I shared with him both the audience reactions as well as my wish to create another work. But this time I insisted that it had to be a solo on me. We had both independently thought of the Buddhist TARA as a starting point. It was almost eerie that we thought of the same theme simultaneously in two different continents. The reason that I did not want a group work again was that after UTPALA, I had become very tired of the constant pulls and tugs of group politics and that my own journey was very different from the group dancers. 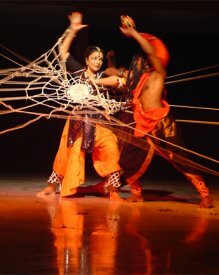 I think that the idea of a professional dance company in India without the umbrella persona of a GURU is unworkable. That of course is another discussion altogether. In 'Seven Graces' I see your body is going through quite a punishing routine, calling for a lot of body balance and tough movements. How difficult is it to keep up the stamina? It is not a punishing routine but a risky collage of choreography movements that call for emotional balance as well as physical. Since I push everything to extremes...abhinaya and body movements, it seems very tough to the first time viewer. I am very tired after one run through and unlike other run throughs when the adrenalin is coursing and my energy level is actually HIGHER than when I started, with SEVEN GRACES I am so tired that all I want to do is curl up and sleep! Regarding stamina, it is improving slowly daily. The movements you use are a mix of 'Bharatanatyam, Chinese Wu-Shu martial arts, Modern Dance, Tibetan Buddhist liturgical dance and Zen Buddhism.' How do you adjust these with your classically trained body? I have much more movement in my body beyond classical dance. I realised it when I was improvising with DANCE ALLOY in Pittsburgh with Mark Taylor watching. I performed a sequence of 5 minutes without even once using a classical movement and noticed that I drew from a reservoir of movements that even I did not realise I had! Since I am attracted to many sorts of movements, specially ritual and liturgical dances, the choreography for SEVEN GRACES now seems my own from the first day that we began the creation. Actually, it seems as if I am performing my whole life in dance through this one work - my life in various continents, my multiple roles in professional and personal spaces, my reading, writing and educational interests. More than any other work I have ever done in the past, and especially after the visual spectacle of UTPALA last year, this is a very vulnerable work - stark, minimal and tranquil. Since 'this is an abstract work and not a literal retelling of Tara and her attributes,' would the audience be able to comprehend what you wish to convey? What are your special inputs in the choreography? If I were to worry about understanding, I would never get started on any of my dreams. I always retort to such a question with another question - "Do you understand what is happening around you in real life? Do you even comprehend some of the strange happenings that you read in the papers? Then why impose the word UNDERSTANDING when it comes to abstract dance? Why not you meet me at least part of the way instead of me spoon-feeding you all the time?" To answer you in brief - NO. The audience will NOT understand the abstraction but I am not worried. In fact, I am hoping that they will be able to rise above the non-literal story telling that I am NOT using and enter into the stream of moods and images that have been deconstructed and reframed through the work. Regarding the choreography, this is a collaborative effort. Hari has not come with preconceived set of movements that he has just taught me. We are 15 years apart in age and that makes for a significant difference in life experience and even in the way we touch our own skins. Hari and I were very clear that SEVEN GRACES had to reflect a personal and new side of me, reveal an experience never seen before. The section with the 'jathis' was totally from my repertoire of the past with the spacing and the energy levels adjusted for the work. The section of washing feet and hands, as well as the trance section, was drawn completely from my personal moodscape and internal psychosis. The first section of extended pulling of the umbilical chord was just narrated to me as TARA bearing the sorrows of the seven worlds on her back as journeys to help humanity. I had to internalise it for the full 12 minutes with my back bent throughout! The vignettes that punctuate the piece are from my improvisations during rehearsal sessions. Me adoring my two kids, my love of waking up alone in my bed and my hate for cats... Hari has functioned as a catalyst, choreographer, movement editor and director while I have contributed as a performer and a co-choreographer. And yes - volatile clay! Your last solo work was 'Vaitharani.' How does it feel to perform a solo after a lot of group productions? Dancing solo is the only way that I should work in the future since it is not fair to me or the group to work together. I love being in the space alone again. It is very exhilarating for me. I just hope that the audience feels the same way. VAITHARANI is still remembered fondly or with anger by many since it was a risky theme. SEVEN GRACES is not as focused as the theme of after-life. It is about life itself. You must be elated about Seven Graces being booked for two shows at New York at the Rubin Museum of Art in relation to RMA's current exhibition Female Buddhas: Women of Enlightenment in Himalayan Art. Not as much as people think. It seems to be a huge coup to get a booking in the US. While the performances are certainly a happy coincidence of timing with their own exhibition running concurrently, it is to perform to different audiences in India that is the greatest challenge. Presenting my work at a feminist conference in Gujarat later this year or to the traditional sabha crowds in December will be a real test. The West is very aware of Buddhism by now. There are so many great scholars of Buddhist studies in New York and they will view the work very differently from Krishna Gana Sabha crowds. There I will not have to worry at all about issues of understanding. They will come to the theatre with so much information. It will be a challenge to surprise them with a new version of the old knowledge. You collaborated with many artistes on more than one occasion - Dipankar Mukherjee, Prasanna Ramaswamy, Mithran Devenesan, Jaan Freeman and now Hari Krishnan. How does this collaboration differ from your other partnerships? With all other directors/choreographers, there was no strong classical dance background to build from. Except for Jaan, the others all came from theatre training and were skilled in "blocking" the movement and directing spatial energies rather than actually engaging me in improvisational exercises. Jaan comes from a purely modern dance background and moved towards Bharatanatyam late in his career after being involved in PURUSH in 1995. The 3 works created with Jaan were all short dances. 5 to 10 minutes in length. Hari and I have now completed two full length evening works together. Hari Krishnan comes from a very similar cultural milieu like mine. Tamil, Carnatic music, Bharatanatyam and a life experience in North America. He has also developed a much stronger sense of the classical vocabulary since he works so extensively with contemporary dancers in America. When we first collaborated in ADHIROHANA, the work gained from the excellent scholarship of Devesh Soneji who was a constant touchstone throughout the development of the work. This time around, Hari did his own research separately and I also read and studied a great deal about the mythology of this enigmatic Goddess. I must mention that my research was greatly aided by writer/director Arvind Iyer who is very close to Tibetan Buddhism and who has been imagining me in a TARA form for about a year. For SEVEN GRACES we had each done a great deal of homework so that we could then throw it all away and allow that knowledge to just stay under the skin of the work - like a throbbing subtext. No literal story telling that audiences are used to. No mythology to cling on to. We began from a clean slate. This time around, Hari has challenged me far more than any other person I have worked with. The work is gruelling physically and also emotionally very draining. In a strange way, I feel that I am dancing my own life story without words through SEVEN GRACES. After doing so many contemporary productions, do you feel your work is receiving recognition at last? I feel that I act out my contemporaniety through my work and not separate the dichotomy of dancing classical and living modern. I would like to think that "I walk the talk". As far as recognition is concerned, that is relative since I am not recognised by either my government, Doordarshan or the ICCR as an artiste to represent India. My wall is filled with several honours but the two main national honours are still to come. And for someone like me who nobody is able to pigeon hole or pin down, it may take longer than imagined! After all, most of my awards have come to me after I turned 40! Besides, I am also a producer and a presenter which most dancers are not! The fact of the matter is that strong, contemporary women artistes are a threat to the establishment. Only very slim, petite, anorexic exotic doll-like classical dancers are patronized by international presenters and our own government. In this scenario, the journey of the contemporary dancer-actor is very difficult, but the challenge is always worth it if I can stay committed to my path. Another problem that I face is that I am a glamorous woman doing serious work. That seems to work against me since I dress well and am very outspoken. Glamour and serious work don't seem to work well in the India of today where everything is reduced to sound bites and 20 minutes of easily digestible packets. The world premiere of 'SEVEN GRACES …into aesthetic realms of Goddess Tara' will be presented on August 17 & 18, 2005 at 7pm, at Sri Krishna Gana Sabha, Chennai.